Bald is beautiful. Look at Patrick Stewart, Bruce Willis, and other such dashing personalities. But, then, where are the bald ladies? Isn’t bald beautiful for them? Alas, no. In our stereotyped society, a woman’s beauty is defined by her long, lustrous locks, whereas a man can be handsome with no hair on his head. This is one of the major reasons for female hair loss sufferers to experience low self-esteem, say hair experts. Most women who visit trichologists for hair loss treatment feel they are no longer attractive. This makes them even more desperate to treat their condition. They begin to use any so-called solution that comes their way. Experts warn against experimenting. Your hair loss indicates there is something wrong with your follicles. Experimentation may put your follicles to more stress. It is better to look out for a relevant, effective solution in the first place and use it. 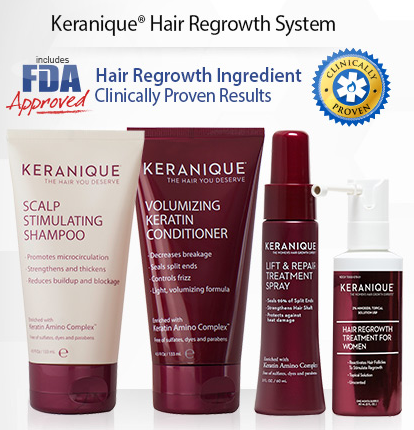 Keranique tops the chart when it comes to effective hair loss treatment, says market reviews. It has swooned women through its gentle, safe, and brilliant way of treating hair. In fact, users of this brand report that they feel their hair are pampered, not just treated. This is a progressive hair loss pattern. Hairs begin to thin out from the top and crown. You may notice a widening of your central hair parting. The name of the condition may make you think that it leads to baldness, but it does not. Nature has been kind enough to women to spare them the horror of going completely bald. Female pattern baldness is characterized by shrinking of follicles. As a result, they produce finer, thinner hair that is brittle and unattractive. With time, these miniature follicles stop producing hair. They die. Keranique is designed to stimulate follicles to produce healthier hair. Timely treatment can prevent premature death of follicles, say experts. So, you must not let hair loss just happen. As soon as you notice abnormal hair loss, consult a trichologist, who would examine your scalp and tell you what’s wrong. Accordingly, you can plan a treatment. Keranique’s treatment comes in the form of a serum, which contains concentrated minoxidil as active ingredient. Just 2 per cent of this compound is enough to create a miraculous change on the female scalp. When hairs are slightly damp, take 1 ml of minoxidil-infused solution in a dropper. Apply the formula directly on the scalp. Style your hair and resume your daily activities. According to the severity of your hair condition, you must use the serum one time or two times a day. Each time, use just 1 ml of the formula. This is an easy solution that can be done within the confines of your home — no clinical visits, no hassles. Simply place an order for the hair regrowth treatment kit and receive it at your doorstep. Women, who are too embarrassed to let the world know about their hair thinning condition, can benefit from this treatment. Online availability of the treatment encourages discretion. So, if you have lost your confidence because you have lost your mane fullness, worry not. Keranique for women can revive your mane’s beauty. It is time to regain your confidence. Keranique.com offers women the ultimate solution for hair loss through Keranique hair regrowth treatment kit. Visit the site to know more about Keranique for women.